Pressure pumps are used to transfer water at high pressures various purposes. They also act as suction pumps to lift water from a level lower that the output level, and are used for spraying and irrigation purposes. They are normally used for basic pressure wash using water from an overhead/other tank. The pressure washer uses high-pressure streams or jets of water against a surface to de-grain, degrease, clean etc. Known as the pumping unit, the pressure pumps force out the fluid at a high velocity. There are a variety of pressure pumps available, which are used at home just to operate the sprinklers on a lawn to the industrial applications. When selecting a pressure pump there are a lot of factors to be considered, right from specifications, power source, and kind of fluid to be discharged, to the pump features as well. Pressure pumps are made according to specifications such as the maximum discharge flow, the discharge pressure, and the temperature at which it will be contained. The pressure pumps source of power can vary depending on requirements. 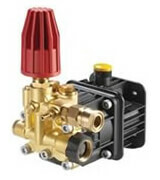 There are AC powered, DC, Air to Pneumatic, Hydraulic and even manual pumps to choose from. Crankshaft driven plungers that are more economical than the intensifiers, and are used more commonly as well.